Town of Oakville (Lower Tier Halton)Record Owner? Log in. The town was founded by Col. William Chisholm who had moved with his United Empire Loyalist parents to the nearby Burlington Beach area in 1793. In 1827 Chisholm bought land at the mouth of Sixteen Mile Cr., built mills, laid out a town plot, and opened the harbour to shipping. The settlement was frrst called Sixteen Mile Creek. Robert Baldwin Sullivan, a friend of Chisholm's, suggested the place be called Oakville for the white oak that grew here and were being used for barrel staves and later ship building. In 1855 the Great Western Railroad passed through Oakville, and in 1939 the QEW was opened, linking Oakville with Toronto and Niagara Falls. In 1953 the Ford Motor Company built an assembly plant in Oakville. Natural Resources Canada in the Region of Halton. 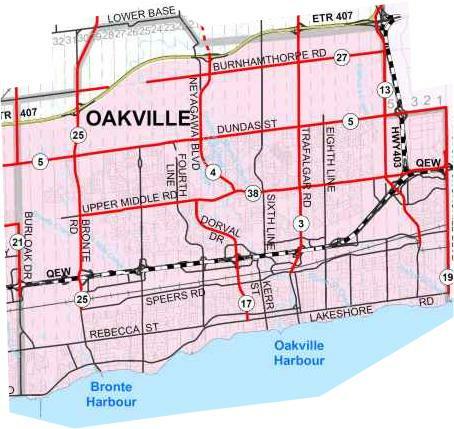 Have something to say about Town of Oakville (Lower Tier Halton)?